Available in all colours and Scents, Please specify when ordering Approximate burn time of 8hrs (Our recommended burn times are very conservative. Burn times can be affected by burning conditions.) Due to the hand crafted nature of Beacons Creative Products, the colour, pattern and decorative packaging may vary. 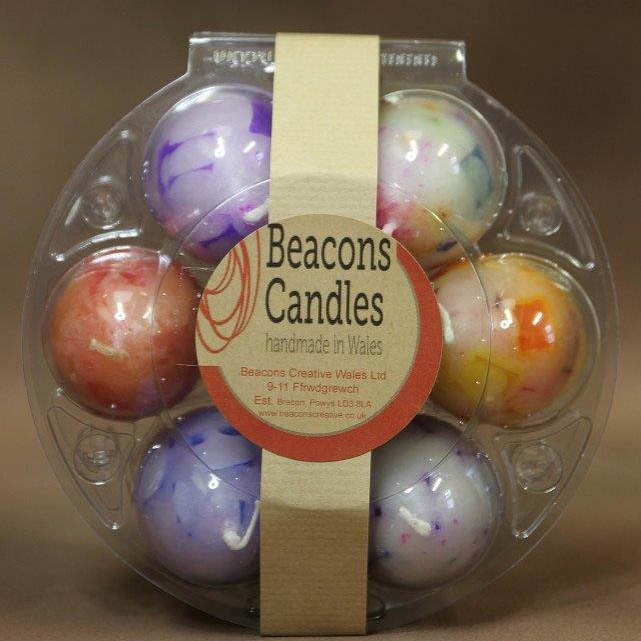 Burn in a heat resistant receptacle to retain any molten wax. Remove packaging before use . Candle containers will get hot , burn candles away from flammable materials. Keep out of reach of children. Never leave a burning candle unattended. Keep wick trimmed to 5mm. For best results burn candle for 3 -4 hours at a time. Sold in a pack of six.